In the weeks leading up to Christmas there are many events and traditions in Norway, just as in most countries in Europe and beyond. Here, many of them centre around children, and singing. 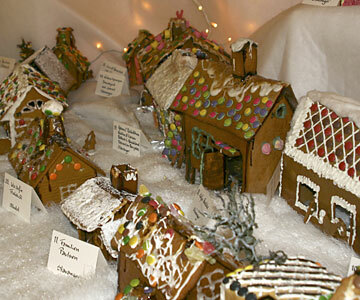 Schools and barnehager (nurseries), plus families at home are busy baking cakes and biscuits, with many making houses made of ginger-bread "pepperkakehuser" and entering competitions for the best. You can then see all the entries collected together in "towns". In Stavanger, the newspaper Stavanger Aftenblad runs a competition and the town can be seen in the Arcaden shopping centre in the centre of town. Another popular competion is for Christmas pictures made by children. The entries to this will be shown in the Children's Museum in the Stavanger Kulturhuset from 15 December. In Egersund there is a great Christmas market each year, and we are hoping that next year - 2008 - there will be something similar in Stavanger, organised by Byen. 13th December sees processions and church services for Santa Lucia. Saint Lucy was a third century martyr celebrated by the catholic and authodox churches, plus protestant Scandinavia. The festival goes back many centuries to when 13 December was the shortest day - winter solstice - of the Julian calender - and celebrates that the days will soon be getting longer again.